When you think about nonprofits and their work, what comes to mind? Some immediately think about mission, programs, services, outcomes, impact, resources, and funding. Others think about the capacity of nonprofits to effectively and efficiently deliver programs and services to children, youth, families, adults, seniors, and communities. There are also those who think about how nonprofits can best advance social movements. Given the chaotic political and social time we’re living in, all of these perspectives are reasonable and valid. However, one perspective is conspicuously absent. When thinking about nonprofits and their work, why don’t we also think about the professionals who fuel nonprofit work each day? Fund the People believes it’s important to bring together talent-investing and capacity building to demonstrate the key aspects of how nonprofits can advance their missions. The glue that holds these two frameworks together is nonprofit professionals. Without attention to the human element of nonprofit organizations, it will be difficult for capacity building efforts to gain momentum and achieve their intended results. It’s critical for funders who support capacity building to broaden their perspectives to holistically support their grantee partners by including talent-investing. The sector can’t afford to overlook investing in nonprofit talent if we want to achieve significant change and impact. For many years my work in philanthropy included roles as program staff at a community foundation, private foundation, and health foundation. I was focused on helping to build the capacity and leadership of nonprofit organizations so they could deliver much-needed programs and services, and advocate for social change. I was laser-focused on specific functional capacities to ensure organizations had the support they needed to be effective. What I was not as in tune with was the human capacity of grantee organizations; I was only seeing part of the picture. I interacted with board members, executive directors, senior managers, and fund development staff about their funding requests. However, I wasn’t talking with them about what they needed in terms of staff support. And I was not interacting as closely with front line staff who deliver programs and services in their communities. Hearing from frontline staff regarding their professional development, leadership development, and compensation needs would have helped me to better understand what I, as a funder, could have offered to ensure that they were able to do their best work. Given our increasingly challenging climate, it’s imperative that funders and nonprofits look more closely at talent-investing. While the functional aspects of nonprofits are necessary for organizations to operate, it’s also necessary to intentionally deploy resources to support and develop the nonprofit workforce. Without having a well-supported, trained, and equipped staff of nonprofit workers, organizations won’t be able to advance their missions and combat the assaults on struggling communities and populations across the country. 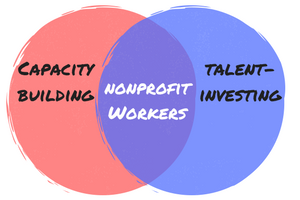 The National Council of Nonprofits defines capacity building as “whatever is needed to bring a nonprofit to the next level of operational, programmatic, financial, or organizational maturity, so it may more effectively and efficiently advance its mission into the future.” This framework does not explicitly and clearly address the issue of investing in staff. And it just makes sense that operational, programmatic, financial, or organizational development is not possible without the people who make it happen. We can no longer afford a disembodied approach to capacity building. Rather, we should see the capacity to support and develop people as the bedrock upon which organizations can develop most – if not all – other capacities. Fund the People talks about this as people systems – the array of organizational practices, policies, habits, and structures that support and strengthen the morale, ability, and advancement of employees and volunteers so they perform at the highest levels of excellence. There is a growing set of funders who are providing talent-investing support for their grantee partners. One of these funders is the Chicago-based Pierce Family Foundation. According to Marianne Philbin, executive director, “We initially wanted to help grantees with the basics of operations and organizational development, especially fund-raising, but we found that the challenge wasn’t just in filling gaps in areas like donor management software or budgeting — it was personnel, skills, and capacity. We realized we needed to invest in staff, not just in tools and processes.” The Foundation took a step back to learn directly from their grantee partners about the types of support they needed to support their human capacity. A core talent-investing grantee of the Pierce Family Foundation is Spanish Coalition for Housing (SCH), a nonprofit that provides comprehensive counseling, financial education, and housing resources. With the Pierce Family Foundation’s support, SCH made professional development opportunities available to their team, and made staff development part of their organizational culture. This has increased the opportunities for internal promotions. Also, SCH staff feels valued by the organization; this has increased employee retention and improved the quality of SCH’s programs. According to Gabriela Román, SCH executive director, “In order to fulfill our mission, we need the best set of people. From my experience, it’s been better to develop our own people than to hire from the outside, because our line of work is so narrow. I definitely want to develop a pipeline of leaders, especially among those who have been here for a while, so that our organization can replenish itself.” This is a key example of how a funder honed in on the human element of their grantee partner, which helped to strengthen the grantee’s team and organizational capacity. As nonprofits continues to evolve and be nimble in this ever-complicated environment, it is critical for funders to devote attention and resources to support talent-investing. If we want nonprofits to effectively advance their missions we must invest in the staff that make programs, services, and advocacy happen. Are you a funder with a talent-investing story you’d like to share? Let me know at yolanda (at) fundthepeople (dot) org. Editor’s note: Learn more about how the Pierce Family Foundation invests in mid-level managers and emerging leaders in this field story.